I graduated from Souris School in 2008 with Distinction and received the Governor General’s Academic Medal. In the fall of 2008, I received the Board of Governors Entrance Scholarship upon admittance to Brandon University. Following the completion of my first year, I was awarded the General Proficiency Scholarship in First Year Science. During my second year at Brandon University, I was placed on the Honours List and was inducted into the President’s Honour Society. This January, I was awarded the President’s Leadership Scholarship. Next spring, I will graduate with a four-year Bachelor of Science with a Biology (Biomedical Stream) Major and a Chemistry Minor. When I was 16 years old, I began the recruitment process for the Canadian Forces. I was officially “sworn in” on May 3, 2007, as an Artillery Soldier in the Primary Reserve. I worked in this position for the first three years of my career, until I made an occupational transfer to a Medical Technician position. I have been a medic for the last two years and currently hold the rank of Corporal. My experience as an Army Reservist has allowed me to learn much about myself. One of my fondest memories is of sandbagging in my own community during the flood of 2011. The accomplishment that I am most proud of is my work in Emergency Services. 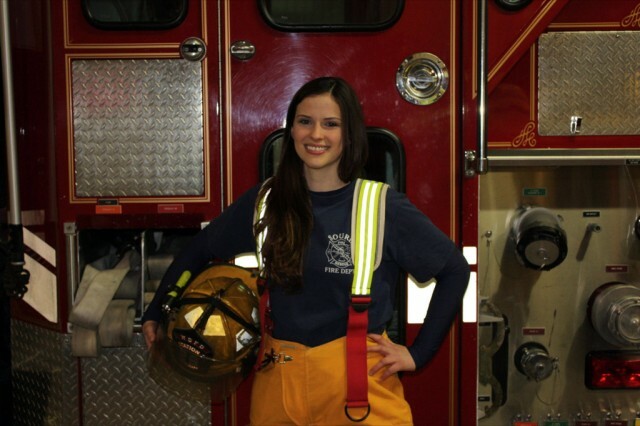 When I was 17 years old I began volunteering as a youth member on the Souris Fire Department. After my eighteenth birthday, I became a volunteer member of the department and completed the Fire Fighting Level I course during my first year in university. Since certification, I have taken additional courses such as Vehicle Extrication and Incident Command Systems. Also during my first year of university, I completed the EMTech course provided by the Assiniboine Regional Health Authority Emergency Medical Services. I have been licensed by Manitoba Health as a Technician for almost three years and currently work with the ambulance service in Virden and Souris. I have additional education (termed “Transfer of Functions”) and have been granted the privilege to provide some of the basic medications used in EMS (emergency medical services). I was born and raised in Souris, Manitoba, where I live with my parents and my sister. I have always enjoyed the outdoors, particularly activities that get me into the water. I swim laps regularly and have enjoyed scuba diving for the last four years. I am presently an active volunteer with the Brandon Regional Health Authority, the Souris Fire Department and the Brandon University Student Leadership Program. I am a member and have previously been an executive member of the Brandon University Zoological Society (BUZS). In the past I have volunteered at organizations such as the Brandon Humane Society and the Souris District Arts Council. I grew up with a wonderful and supportive family. My stepfather has been involved with emergency services for more than 28 years. As a child, I remember his pager going off and him swiftly leaving for the call. I always wanted to go with him! Today, my stepfather and I have worked many emergency calls together and make an excellent team. My experience as a frontline health care worker has been truly rewarding. Although health care was not initially a career goal, the experience of EMS has inspired me to pursue a career in medicine. I have always loved working with others and helping those in need. I value hard work. Since Grade 8, I have been continuously employed at one or more jobs while attending school full-time. This has allowed me to complete my university degree without a single student loan and minimal parental financial support. I believe it is important to be dedicated to one’s studies and remain faithful to one’s commitments. With this in mind, I believe the key to contentment is to be involved with activities and organizations which one is passionate about. I look forward to going to work and cracking open my textbooks. I hope to have a career which I love for the job itself; I strongly feel that money and status are poor motivators, particularly for individuals interested in the field of health care. Next year, I intend to graduate from Brandon University with a four-year Bachelor of Science. This fall, I plan to apply to several Canadian medical schools. I believe I would enjoy the challenges faced by today’s physicians. In the future, I can see myself continuing to provide health care in a rural setting. Darla Palmer hails from Souris, winning the Governor General’s Academic Medal in high school. After admission to BU with several scholarships, she continued her study with distinction and recognition, garnering several academic scholarships and attaining the Dean’s Honour Roll and the President’s Honour Society. Next spring she will graduate with a four-year Bachelor of Science with a Biology (Biomedical Stream) Major and a Chemistry Minor. In parallel with her studies she is Medical Technician in the Canadian Forces Army Reserves with a rank of Corporal. She is an active volunteer with the Brandon Regional Health Authority, the Souris Fire Department and the Brandon University Student Leadership Program. She has served on the executive of the Brandon University Zoological Society (BUZS). She is proudest of her work in Emergency Services, completing the EMTech course provided by the Assiniboine RHA Emergency Medical Services. She is licensed by Manitoba Health as an EM Technician, currently working with the ambulance service in Virden pursing further qualifications. Not too surprisingly, Darla is planning on a career in medicine and intends to practice in the Westman region. She is distinctively accomplished for one so early in her career.